Smart cars — whether self-driving, autonomous or connected — represent the biggest opportunity for manufacturers and their employees since Henry Ford’s first Model T rolled off the assembly line over 100 years ago. This was the gist of a conversation between three automotive experts during a recent episode of SAP’s Future of Cars with Game-Changers radio broadcast. Hosted by Bonnie D. Graham, the show focused on the transformations car manufacturers and their customers can look forward to as connected cars hit the road in growing numbers. Companies also have to equip future employees with the technology skills for tomorrow’s auto factories. According to Kim Knickle, Research Vice President at IDC, effective workforce education starts in elementary school with a diverse population of children by gender and ethnicity. “You have to find the kids who really will be excited to be in manufacturing…and make sure they know how they get to work with all sorts of new kinds of tools and robotics,” she said. Of course, manufacturers need to understand machine learning in order to take advantage of it. Mike Lackey, Global Vice President of Solution Management LoB Manufacturing at SAP, said software vendors have an equally important role in this transformation. But design is much more than how a car looks. Knickle said manufacturers need to understand how innovations make the technology components work together. She predicted the rise of plant floor workers using automated assistance technology, robotics, 3D printing, artificial intelligence, and augmented and virtual reality tools. 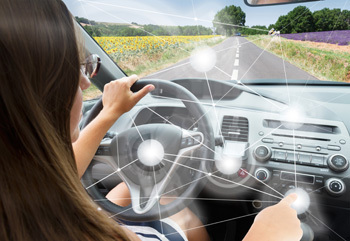 “Digital twins are absolutely one of the most important things for supporting the experience that customers want from the design of the car to the service, but we’re not able to fully understand the possibilities for machines with cognitive computing,” she said. Graham closed the discussion with a call to action for the industry. “The physical world is going to collide with the digital world which will collide with the business world, and that’s what’s going to drive future of the automotive industry,” she said. “We should be looking at how these three worlds collide and come together to add value to the end-user.